Ages 4 through 9. Here is a collection of high-interest activities and games that you can use to build fluency in children with stuttering problems. Students learn the "feel of slow speech" as they practice easy movements of the articulators during speech production. Special features include easy to use tasks for assessing fluency, high-interest lessons, a short story audio CD with lively songs that reinforce "easy speech" and build motivation, short stories that strengthen language skills while children practice fluency strategies, and more. 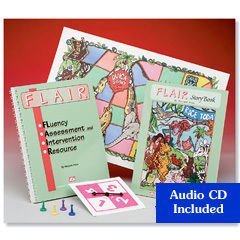 Assessment Procedures - FLAIR assessment includes a Fluency Questionnaire for Parents, Classroom Fluency Questionnaire, Pragmatic Assessment of Fluency, and a Disfluency Analysis Form. Specific strategies for conducting assessments are included. Listening Time and Story Time activities are included in many of the lessons. Question and answer games, situational role playing, peer conversations, and other activities maintain children's interests and develop important language skills as children work on fluency goals. The complete kit includes the activity manual, short story manual, full-color game board, spinner, playing pieces, and an audio CD. Note: The audio cassette has been replaced by an enhanced audio CD. Regular Price: $69.00. Save $10.00 by ordering now!